Getting ready to cross the historic Chapel Bridge over the Reuss River in Lucerne. It was very cloudy both days we visited Lucerne so it’s hard to tell the difference between the snowy mountains and the gray-white sky, but those are the Swiss Alps off in the distance – they are magnificent! We’ve had an amazing two days in Switzerland! 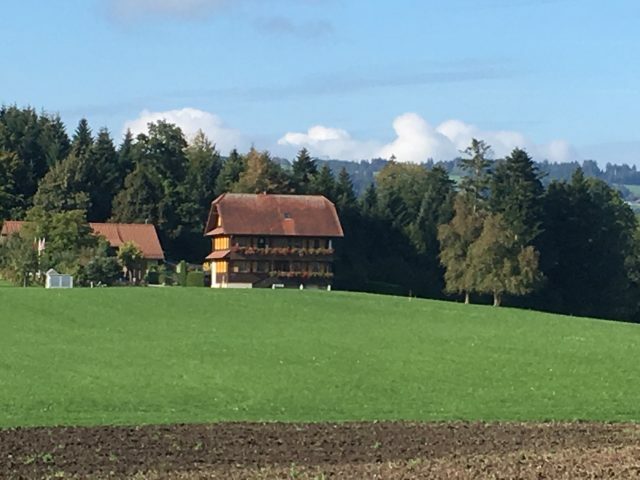 Our Airbnb is located in the Swiss countryside. This farmhouse is behind the one we’ve stayed at. We had an easy drive from Strasbourg down to the village of Sempach, just outside of Lucerne, on Monday. It was overcast, and rained part of the way, but the highway was good and there was only a slight amount of traffic as we drove through Basel. The only glitches along the way were that we weren’t directed to get off the highway to purchase our Swiss highway vignette, which is a requirement even for a rental car in order to drive on any Swiss highway. Also, we were expecting to pay tolls for driving on the French portion of the highway but never were stopped. We’re guessing we’ll have to pay those when we exit the highway in Strasbourg tomorrow. Otherwise, everything went as planned and the whole trip took a little over two hours, start to finish. Oh yes – our GPS also directed us to the wrong house! We got that straightened out, but it was a bit embarrassing. The farmhouse where we’re staying was originally built in 1735. There is one bedroom on the first floor as well as a huge living room and kitchen, eight bedrooms on the second floor and two on the third floor. The range and oven are still wood-fired. Our Airbnb experience here has been well beyond anything we imagined and has made our trip very special. 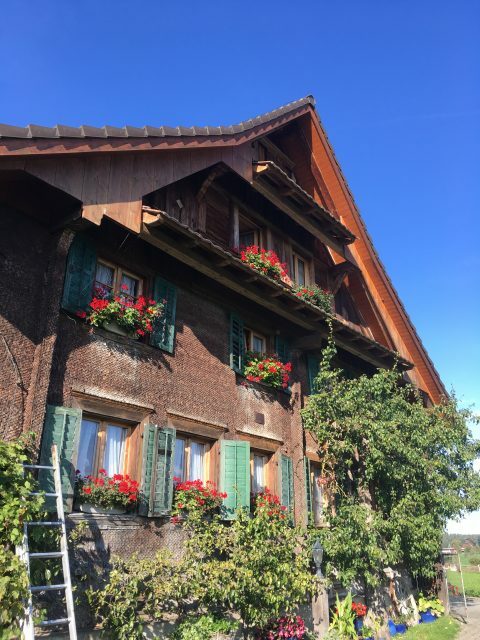 We are staying in a traditional Swiss farmhouse where we have a spacious room on the top floor along with a private bathroom. The original house was built in 1735 (! ), and our hosts have owned the house since 1945 and have raised ten children here. Surrounded by other farms, our hosts keep draft horses, chickens and rabbits (HUGE black rabbits that terrified me), and have loads of fruit trees (cherries, plums, pears and several varieties of apples as well as grapes and berries) on the property. We can look out over the beautiful surrounding farmland from our bedroom windows. 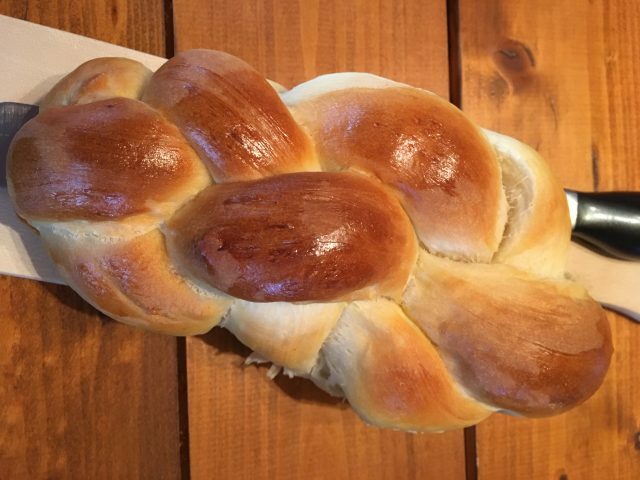 Brett and I made braided bread one evening with our host, Madlen, and enjoyed it for breakfast the next morning! 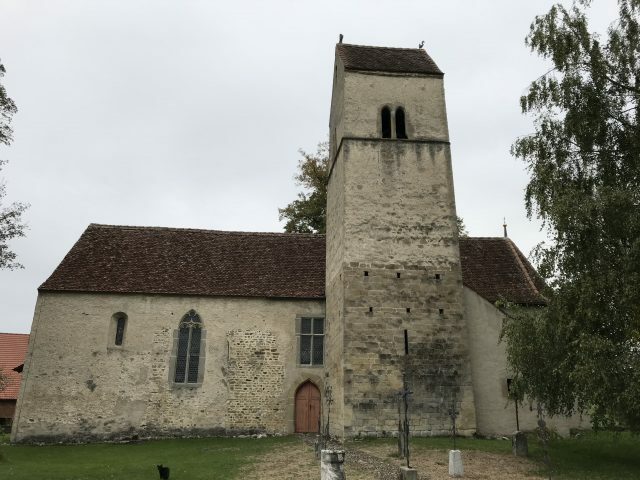 This church in Sempach was built in the 12th century and is still being used. The interior was fascinating, but too dim to photograph. We were greeted with coffee and fresh-baked apple cake when we arrived at the farmhouse late Monday afternoon. We have also been provided with a huge farm breakfast every morning: yogurt and cheeses from neighboring farms, meats, homemade breads and jam, fruit from their trees, coffee, juice and so forth – it’s been incredible. On our second evening we made bread with the wife, Madlen, and learned to do a Swiss braid. She has also driven us to the station each morning to catch the train into Lucerne and picked us up in the afternoons. Although it wasn’t included in the price we paid for our room, we were also invited to dine with the family this evening and enjoyed a traditional Swiss meal of raclette (melted cheese) and potatoes. 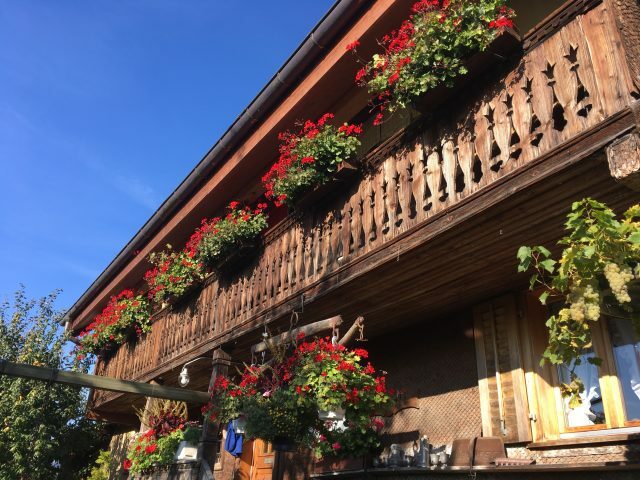 Madlen has also taken us to see the (charming) village of Sempach and tour a local church built in the late 12th century (that is still being used today) and to stop for an amazing, breathtaking view of the Alps. Today she drove us through the beautiful countryside to view the many farms in the area. Lucerne is an incredibly beautiful city, but surprised us somewhat by being a bit smaller than we imagined. 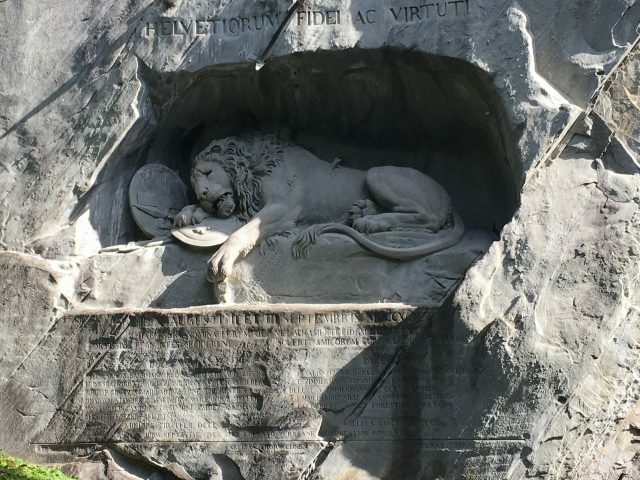 We were easily able to walk throughout the city in a few hours yesterday, visiting the Lion Monument (very evocative and moving), walking the length of the old city wall and climbing some of its towers, crossing the Reuss River several times including a couple of trips over and back on the historic Chapel Bridge. 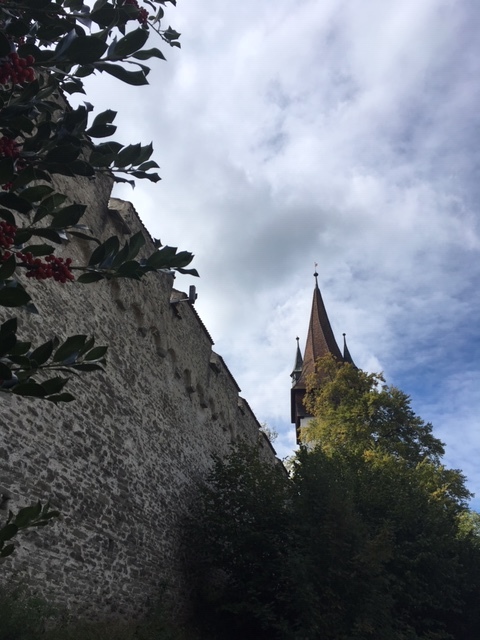 We enjoyed a delicious lunch of cheese fondue in the old section of Lucerne, stopped for coffee and cake by the lake in the late afternoon, and shared a small package of fresh roasted chestnuts by the river. We were full enough from all of those that we didn’t need any dinner last night! 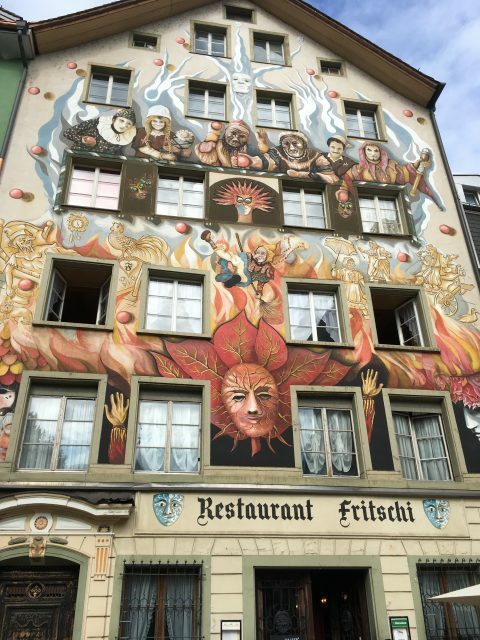 The beautifully painted front of the Fritschi Restaurant, in old Lucerne. Brett and I shared an order of fondue for one (!!) but both of us were stuffed when we finished. Today we went back to Lucerne and visited the incredible Swiss Transportation Museum. We rode one of the ferries across the lake, a fun experience. Lake Lucerne is very clean and the water very clear. We also got another magnificent view of the Alps during the ride. The Transportation Museum was one of the best museums we have ever visited and was extremely interactive and informative both for adults and children. Our favorite section was Wheeled Vehicles which had everything from cars and buses to bikes and baby strollers. We had a light lunch at the museum and then headed over to the Lindt World of Chocolate Experience, where we climbed on a Disney-esque sort of vehicle and rode around to learn all about Swiss chocolate. We were given enough free Lindor Truffles on the ride and in the shop afterwards to practically cover the cost of one of our tickets (but we also bought some chocolate too). Crossing Lake Lucerne by ferry. 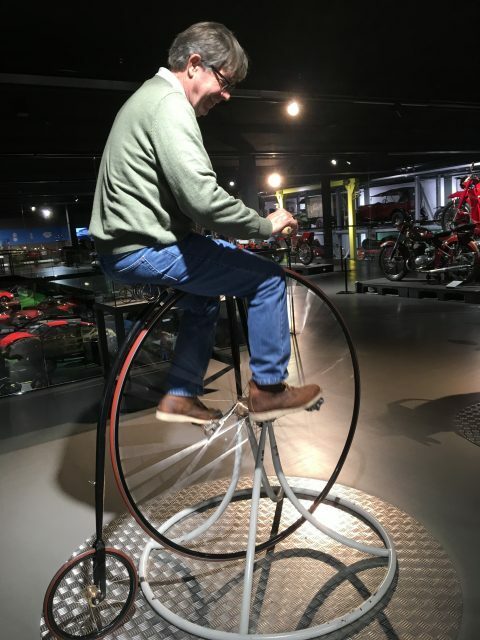 Brett tries out the original Big Wheel at the Museum. How anyone ever climbed onto one of these bicycles (or got off) remains a mystery – we found it nearly impossible. 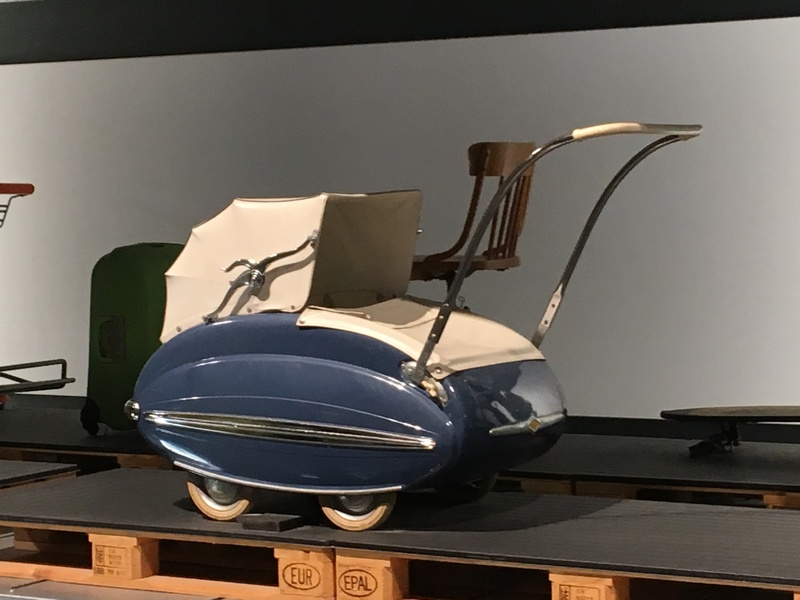 My favorite exhibit at the Transportation Museum was this futuristic Swiss baby stroller from 1959. ALL the Lindor truffles, in flavors we had never seen before, including cappuccino, strawberries & creme, champagne, and others. If I had to find a downside it’s that Switzerland is expensive. Very expensive. Prices, including for transportation, have frankly shocked us. We have easily spent over $100 each day, but because we spent nothing on the day we drove down and will spend little tomorrow on our drive back our daily average won’t be affected too much. Besides buying a few of the exotic truffle flavors I also bought a Victorinox (makers of Swiss Army knives) vegetable peeler that juliennes. It was just $5US and I expect it to last for years. Back to Strasbourg we go tomorrow morning – our great challenge will be to locate a gas station near the drop off for the car so we can fill the tank. We’ve had a terrific time in beautiful Switzerland, the best Airbnb experience ever, and we’re so glad we were able to fit this short trip into our schedule. Previous Post We Had To Come to France . . .
One of my old college roommates, 40 years ago (BYU), was from Lucerne. Thank you for the pictures of her home city! It looks gorgeous! I do recall she kept me (happily) supplied with great chocolate, but I cannot remember what brand. Lucerne is a beautiful city – not as large as we imagined though. The lake, the mountains, the houses, the bridges, the old part of the city are all well-kept and create the whole package – you know you’re in Switzerland. The countryside surrounding the city is just as lovely. We saw several chocolatiers around town but had heard rumors that their prices could be astronomical so we stuck with Lindt. We’re in process of planning our next trip, and I’m enjoying your pics and putting some of these places on our list. Sounds like Strasburg is a great jumping off point to see quite a bit with not much effort. The Airbnb experience here has been beyond fabulous, more than we imagined. The family is very warm and friendly.The chocolate “ride” and experience was well worth it, especially as they kept giving us those truffles! But overall it’s been a very expensive little side trip – we have to be careful for the rest of the month, even though we were careful here in Lucerne. We really like Strasbourg – I’m looking forward to being back there for another couple of weeks. It’s easy to get around, lots to see, affordable and also easy to go places from there, including back to Paris (to catch trains to other parts of Europe if you’re not driving). It’s also a very international city. We have had no trouble figuring out where to go and people have wanted to speak English to us there as well, more than in Paris or Normandy, so that has helped at times too. I loved The Lion Monument but what is it for? I’m surprised that Switzerland was expensive. I don’t know why but for some reason I always thought it would be affordable there. You have been blessed with your choices of Airbnb places but this one sounds like a real gem. The Lion Monument honors the Swiss Guard who were massacred during the French Revolution in 1792 – they were guarding the palace at Tuileries in Paris. More than 600 guards were killed. We thought Switzerland would be like France when it came to prices but it’s way more expensive. We’ve paid over $30/day for train transportation into town and it’s less than 20 minutes away. 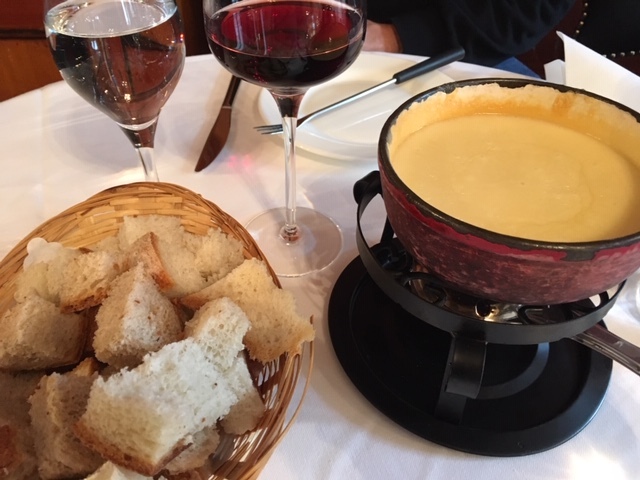 Dining out was expensive too – our simple fondue lunch was over $30 as well. It all adds up quickly even though we’ve been careful. What I know about Switzerland (very little): the trees are counted in the national forestry inventory, there are great recycling programs and manufacturers have to take packaging back, and everything is expensive – but especially peanut butter, which is not popular there! This from a relative who lived there for a year or two. I would love to go to the transportation museum – the one in London is one of my favourite museums ever. And I have to avoid the Lindt outlet in my city! Funny that you mention peanut butter – we asked our hosts and family what American food they didn’t like and in perfect union they all said “peanut butter!” and made a face! It’s turning out to be something we miss, but of course can rarely find it here in France and if we do it’s outrageously expensive. Nutella is turning out to be a nice substitute though ;-O!! The stove and oven in our host family’s home was wood-fired as was a heated seat in the living room (the offen) so we asked how and where they got their wood – did they just walk into a nearby forest or woods and chop some down or ??? Nope, as you said, the trees are counted and certain trees are marked for them to cut down. I thought it was just local thing – interesting to know it’s national. The museum was very interesting and really well done – almost made me wish I had little kids with me again (not really). And those Lindt chocolates – oh my! We had to restrain ourselves in the shop, but they kept giving us samples to try and who can say no to free truffles or free chocolate samples? I was in Lucerne this summer and have a very similar photo in front of the bridge. I agree, the city is smaller than I had imagined. We took a boat cruise on the river and that was nice. I was surprised at how expensive things were there too. I don’t remember how long you’ll be in Switzerland, but if you get a chance, you should visit Mt. Pilatus. Gorgeous views and it’s not far from Lucerne. You can get there by train. Your Airbnb sounds amazing. We were only in Switzerland a couple of days – we would have gone broke if we’d stayed any longer! Everything was beautiful, clean, delicious, etc. . . . but expensive. It was too cold to go up Mt. Pilatus – it actually snowed up there on the second day we were there, and we did not come equipped for snow! Ah, that’s true. I was there in July so it was warm and we only needed a light jacket. Switzerland was really was my favorite of the places I visited and I’d love to go back, but it’s definitely a pricey place to visit. I’ll never forget looking up and seeing nothing but the Alps. It is breathtaking. We were privileged to hike @120 miles through Switzerland in 2010, and I loved it with every fiber of my being. We packed a picnic lunch with grocery items each day, and I thoroughly enjoyed the Swiss way of bagging, weighing and tagging your produce prior to checking out. A kind local helped us out the first time as we stood amidst the apple display in utter confusion, trying to figure out what everyone was doing. It appealed to the small child in me that used to love playing grocery store check out when I was small. My fondest memory is of the cow bells ringing everywhere we hiked. First – that is a LOT of hiking! We want to go back and see more of Switzerland – our trip to Lucerne just whetted our appetite for more. Brett would love to do some hiking there (I’m OK for going uphill but can’t go downhill thanks to my wonky knee). I was so happy we got to see the Alps though – we were expecting rain both days we were there, but got sunshine and somewhat clear skies (and cold, too). The mountains were breathtaking! We do the same with produce here in France at most markets – but at others the clerk does the weighing for everyone at the register. The first time with the weighing though we were like you – totally puzzled with what was going on. We heard the bells occasionally from cows at farms nearby to where we were staying – it’s a lovely sound. This post brings back fabulous memories. 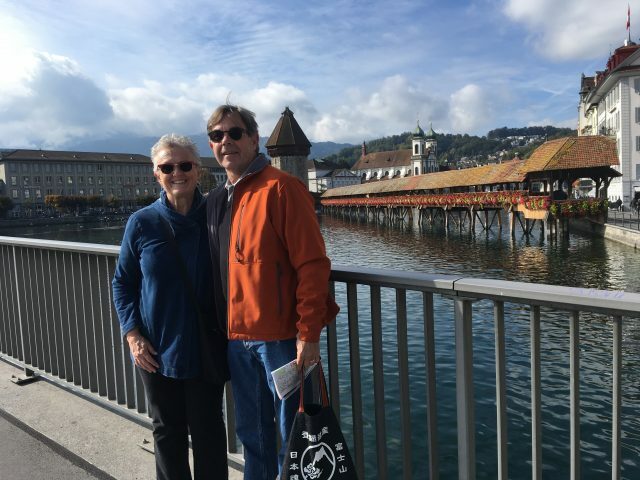 We were in Lucerne in May and found it to be a very special place. Several of the pictures you have posted are of the same scenes and settings that we snapped just over 4 months ago. Enjoy! 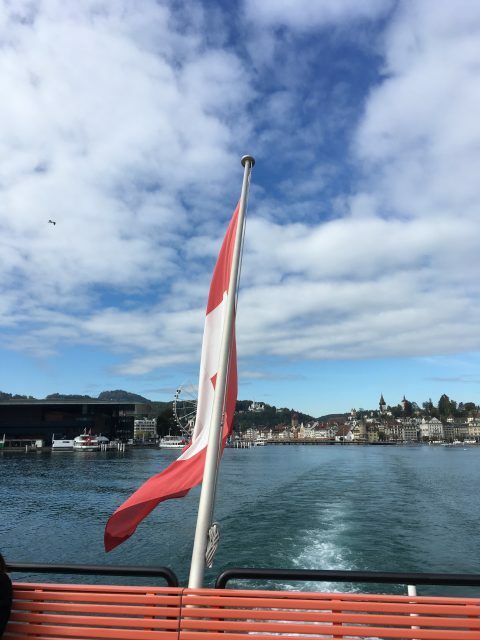 We enjoyed our short visit to Lucerne – such a beautiful city, and so easy to get around as well. It was an expensive little getaway, but both Brett and I agree worth every penny. It was thrilling seeing sights upfront that we had only seen in books or online before, like the bridges, the lake, the Lion Memorial, and the Alps! I think of you and Betty whenever we see a Viking group walk through town here in Strasbourg. Sometimes they contain just a few people, other times the group is huge! Strasbourg is another easy city to get around in though – we are greatly enjoying our time here and glad we decided on a longer stay here. Funny you should mention Viking. We didn’t pack enough warm weather clothes for our trip, so I bought a Viking polo shirt on the boat. Whenever I wore it in the various cities we visited, people assumed I worked for the cruise line and would ask all sorts of questions! I think it got us better service at a lakeside restaurant in Lucerne! Too funny! Maybe they figured if they were nice to you in return you would bring more business back to the restaurant. We found the service everywhere we went in Lucerne to be very friendly and helpful. What a lovely experience! You have surely lucked out with your AirB&B hosts!!! 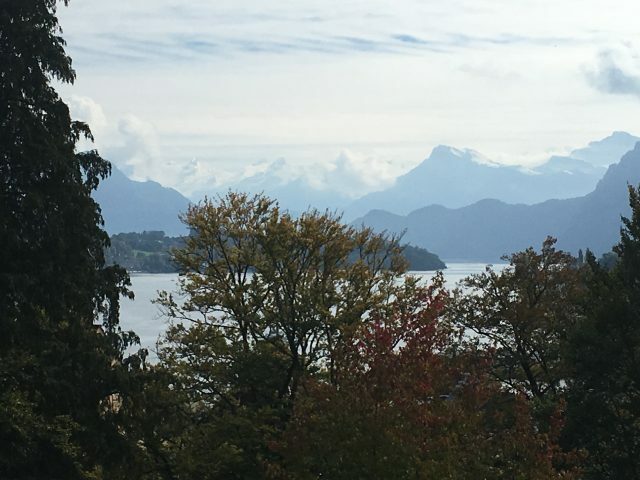 Lucerne looks amazing, so much history, and THOSE ALPS! Our quick trip to Lucerne and our stay at the farm has been one of the true highlights of this trip so far. We loved the area, but it was all very, very expensive. 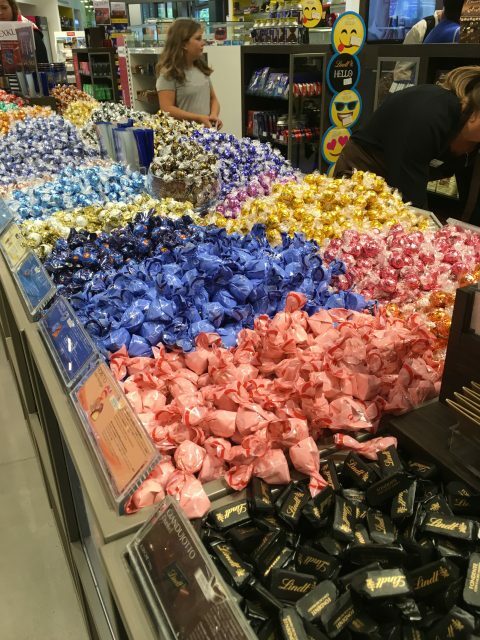 Both Brett and I wish we had bought more of those Lindor truffles while we were there – there were so many interesting (and delicious) flavors we’d never seen before and probably will never see again.